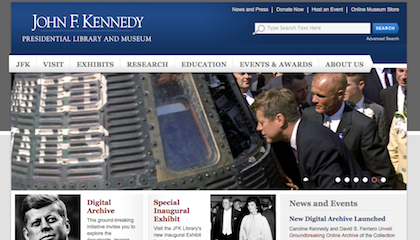 For the JFK fans around the world, there was big news today: The John F. Kennedy Presidential Library & Museum has introduced their new Digital Archive. 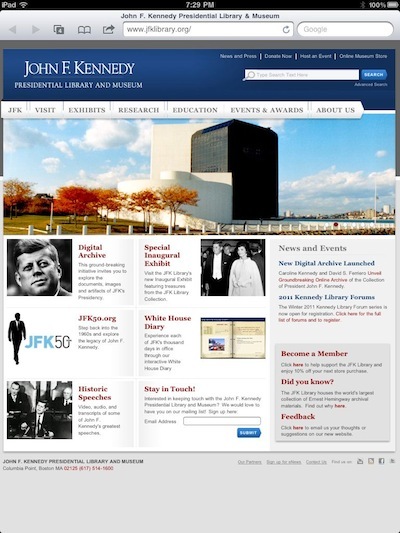 Take a look at www.jfklibrary.org . We had to try the site out today with our iPads to see if there was anything that didn’t work. Using the iPad built in browser, the site looks like it does on the desktop. 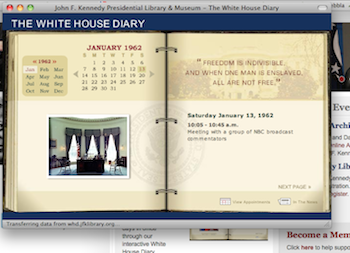 The full library of the Digital Archives is searchable. You can get to the search option via the front page (left, middle) or via the menu bar across all pages. As words are entered, a drop down of options appears. This was a pleasant surprise. Many sites use technology where the list wont show or be selectable. 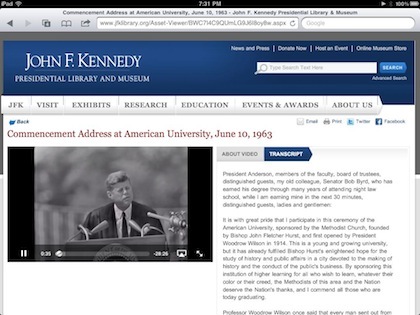 Both work on the JFK site via the iPad browser. 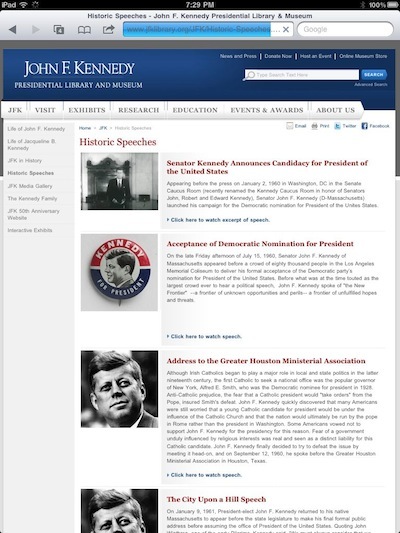 Documents are shown as thumbnails of all of the docs in the set via a scrollable area on the left. Descriptions are on the right. 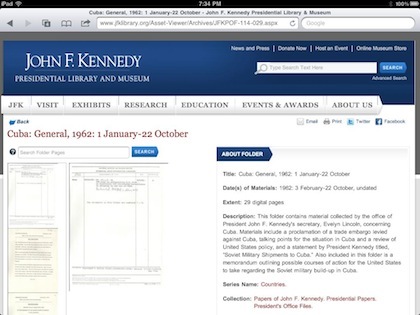 Tapping on any of the documents will expand the view to a full page. Photos open with full descriptions. 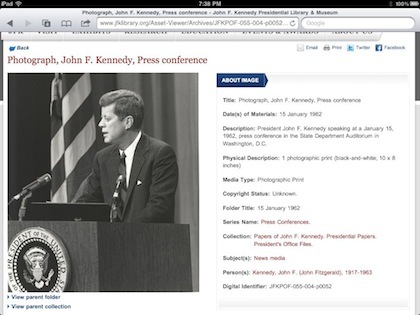 Images include the presidency, growing up family photos and sights they saw on the family travels. There are a few audio files, like the phone messages that wont play. Also, the Diary wont open since it needs ‘Flash’. Below is an image from the desktop browser. 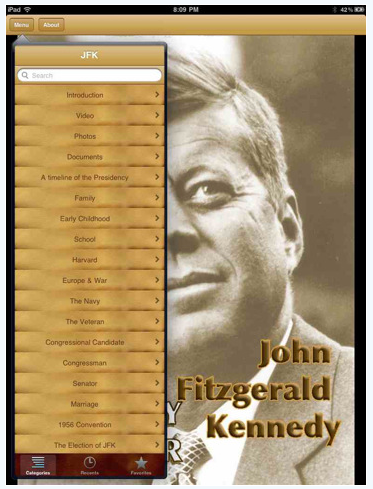 If you are looking for an app that has all the info you ever wanted to know about John F. Kennedy, take a look at the universal app JFK Historymaker. The app is 454 megs so there is a lot of information contained inside. 200 text documents, 250 images and 25 videos.